Docker is an amazing tool for developers. It allows us to build and replicate images on any host, removing the inconsistencies of dev environments and reducing onboarding timelines considerably. To provide an example of how you might move to containerized development, I built a simple todo API with Ruby on Rails and PostgreSQL using Docker Compose for development, testing, and eventually in my CI/CD pipeline. In a two-part series, I will cover the development and pipeline creation steps. In this post, I will cover the first part: developing and testing with Docker Compose. This tutorial requires you to have a few items before you can get started. The todo app here is essentially a stand-in, and you could replace it with your own application. Some of the setup here is specific for this application, and the needs of your application may not be covered, but it should be a good starting point for you to get the concepts needed to Dockerize your own applications. At the foundation of any Dockerized application, you will find a Dockerfile. The Dockerfile contains all of the instructions used to build out the application image. You can set this up by installing Ruby and all of its dependencies. However, the Docker ecosystem has an image repository with a Ruby image already created and ready to use. In the root directory of the application, create a new Dockerfile. Open the newly created Dockerfile in your favorite editor. The first instruction, FROM, will tell Docker to use the prebuilt Ruby image. There are several choices, but this project uses the ruby:2.4.0-alpine image. For more details about why I’m using alpine here over the other options, you can read this post. The Dockerfile needs more instructions to build out the application. Currently it’s only creating an image with Ruby installed, but we still need our application code to run inside the container. Let’s add some more instructions to do this and build this image again. This particular Docker file uses RUN, COPY, and WORKDIR. You can read more about those on Docker’s reference page to get a deeper understanding. Bundled gems are installed into /usr/local/bundle. Step 8/8 : COPY . .
You have now successfully created the application image using Docker. Currently however, our app won’t do much since we still need a database, and we want to connect everything together. This is where Docker Compose will help us out. Now that you know how to create an image with a Dockerfile, let’s create an application as a service and connect it to a database. Then we can run some setup commands and be on our way to creating that new todo list. The Docker Compose file will define and run the containers based on a configuration file. We are using compose file version 2 syntax, and you can read up on it on Docker’s site. For example, the app directory will be created during the build. We then map that directory to the host machine, and the host machine app code will be used during “runtime.” This allows us to make changes locally, and those are then accessible in the container. This will take a bit to unpack, but let’s break it down by service. command: bundle exec rails s -b 0.0.0.0 – Once the image is built, and the container is running, the bundle exec rails s -b 0.0.0.0 command will start the application. volumes: – This section will mount paths between the host and the container.
.:/app/ – This will mount the root directory to our working directory in the container. environment: – The application itself expects the environment variable DATABASE_URL to run. This is set in ./config/database.yml. ports: – This will publish the container’s port, in this case 3000, to the host as port 3000. The DATABASE_URL is the connection string. postgres://todoapp@postgres/todos connects using the todoapp user, on the host postgres, using the database todos. Like the Ruby image we used, the Docker Store has a prebuilt image for PostgreSQL. Instead of using a build directive, we can use the name of the image, and Docker will grab that image for us and use it. In this case, we are using postgres:9.6.2-alpine. We could leave it like that, but it has environment variables to let us customize it a bit. environment: – This particular image accepts a couple environment variables so we can customize things to our needs. POSTGRES_USER: todoapp – This creates the user todoapp as the default user for PostgreSQL. POSTGRES_DB: todos – This will create the default database as todos. Now that we have our services defined, we can build the application using docker-compose up. This will show the images being built and eventually starting. After the initial build, you will see the names of the containers being created. At this point, the application is running, and you will see log output in the console. You can also run the services as a background process, using docker-compose up -d. During development, I prefer to run without -d and create a second terminal window to run other commands. If you want to run it as a background process and view the logs, you can run docker-compose logs. This will tell you the name of the services, the command used to start it, its current state, and the ports. Notice rubyrailstodoapp_web_1 has listed the port as 0.0.0.0:3000->3000/tcp. This tells us that you can access the application using localhost:3000/todos on the host machine. A small but important step not to overlook is the schema migration for the database. Compose comes with an exec command that will execute a one-off command on a running container. The typical function to migrate schemas is bundle exec rake db:migrate. We can run that on the web service using docker-compose exec. The schema and all of the data in the container will persist as long as the postgres:9.6.2-alpine image is not removed. Eventually, however, it would be good to check how your app will build with a clean setup. You can run docker-compose down, which will clear things that are built and let you see what is happening with a fresh start. Feel free to check out the source code, play around a bit, and see how things go for you. The application itself includes some integration tests built using rspec. There are various ways to go about testing with Docker, including creating Dockerfile.test and docker-compose.test.yml files specific for the test environment. That’s a bit beyond the current scope of this article, but I want to show you how to run the tests using the current setup. The current containers are running using the project name rubyrailstodoapp. This is a default from the directory name. If we attempt to run commands, it will use the same project, and containers will restart. This is what we don’t want. Instead, we will use a different project name to run the application, isolating the tests into their own environment. Since containers are ephemeral (short-lived), running your tests in a separate set of containers makes certain that your app is behaving exactly as it should in a clean environment. The docker-compose command accepts several options, followed by a command. In this case, you are using -p tests to run the services under the tests project name. The command being used is run, which will execute a one-time command against a service. Since the docker-compose.yml file specifies a port, we use -p 3000 to create a random port to prevent port collision. The --rm option will remove the containers when we stop the containers. Finally, we are running in the web service bundle exec rspec. At this point, you should have a solid start using Docker Compose for local app development. 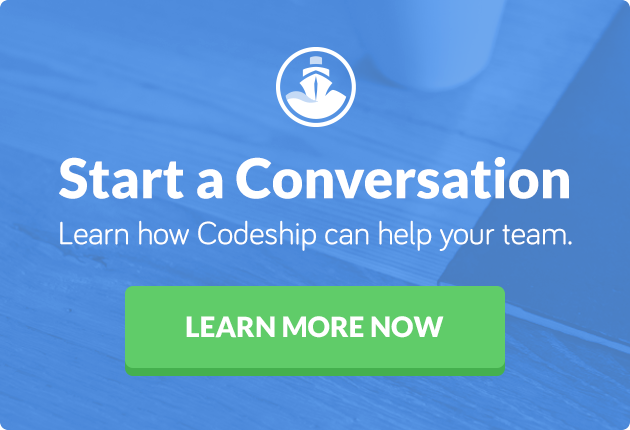 In the next part of this series about using Docker Compose for Ruby development, I will cover integration and deployments of this application using Codeship. Is your team using Docker in its development workflow? If so, I would love to hear about what you are doing and what benefits you see as a result.